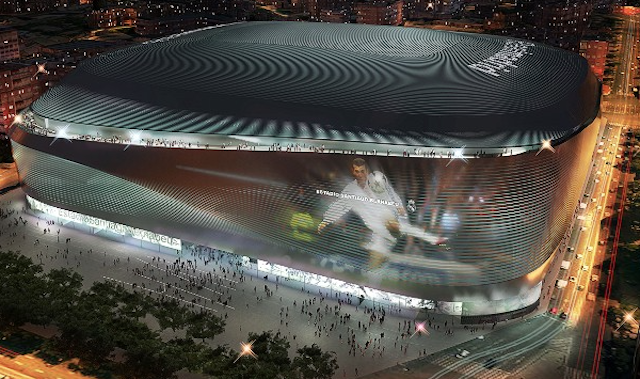 Take a look at 10 super stadiums being built around the world right now, with features ranging from and all LED facade, to an enormous crocodile head, to a towering UEFA Cup statue. By big, we mean some of the largest stadiums getting built in the world. By cool, we mean reflective skins, giant retractable roofs and fields that slide outside. By crocodile-looking, we’re talking a façade that is shaped like a crocodile head. Here’s a look at 10 stadiums you'll be seeing in the near future. The largest roofed entertainment venue in all of Europe will take shape with plenty of moving parts. Designed by Populous to host rugby, the building's locally-sourced white stone will stay in one place; but that's about it. The 82,000-seat venue will feature a fully retractable roof and a field that is retractable too, allowing it to stay healthy in the Paris weather. Okay, we won’t make you wait any longer. Here’s your crocodile. Under construction now, the arena-gator is expected to open early in 2015. 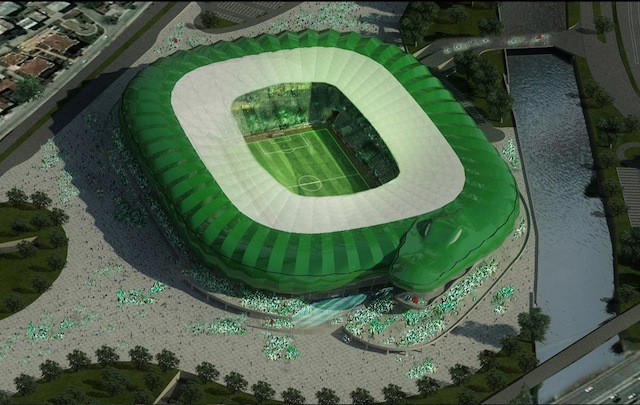 The 45,000-seat venue's reptilian design is a play on soccer club Bursaspor’s nickname, the Green Crocodiles. The façade morphs into a crocodile head at one corner, and if that isn’t good enough for you, the eyes light up. Oh, brilliance! Technically, this isn’t a brand-new stadium, but this rebuild for Real Madrid, considered the wealthiest sports franchise in the world, won’t look anything like the 85,000-seat venue that opened in 1947. 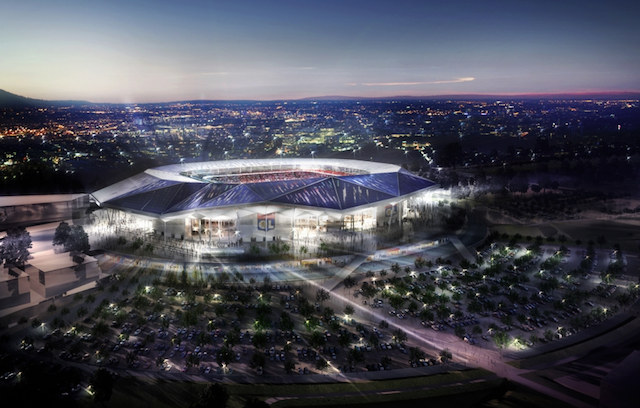 The complete redo of the stadium by German designers will take roughly six years and will include a fully retractable roof (plan on 15 minutes for opening, for those with a stopwatch) and a polished mirror skin of LEDs that can play videos aplenty across the venue. Fancy. 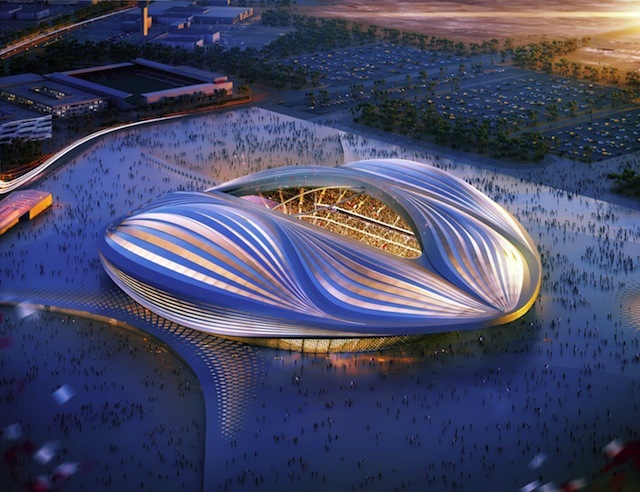 Whatever you think of the design, this planned stadium for the 2022 World Cup in Qatar marks -- so far -- the grandest of the buildings announced for that event. This 45,000-seat venue designed by famed architect Zaha Hadid may end up being just one of many grandiose projects we see come from Qatar. 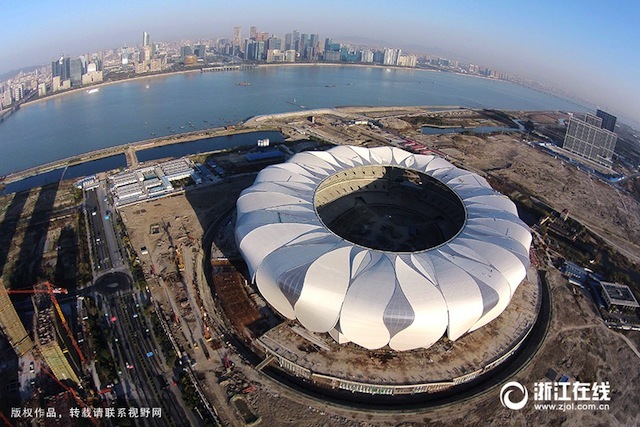 The largest stadium under construction in China will hold 80,000 fans when construction wraps up, likely in late 2015. The flowing panels that wrap the giant stadium give this Chinese city’s new centerpiece a flower-like look. These 56 steel panels designed by NBBJ intertwine for structural support and an aesthetic flair not uncommon in Chinese stadium construction. Assuming the CSKA Moscow fans aren’t banned from their under-construction venue again, they’ll have a 30,000-seat arena with one key element: a skyscraper shaped like the UEFA Cup trophy, the same one the team last won in 2005 (which, frankly, seems kind of like getting your girlfriend's name tattooed on your body. But hey, good for them for being aspirational). 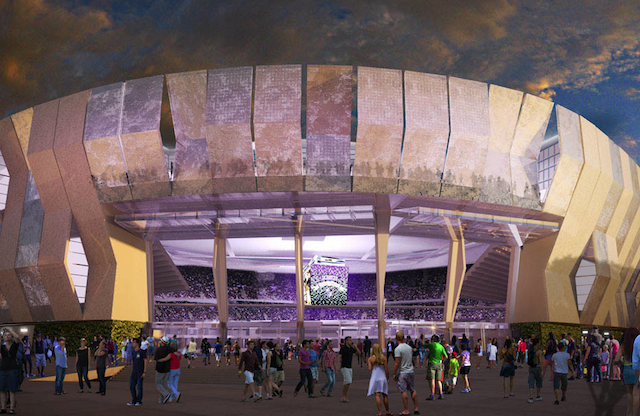 Back home in America, the Sacramento Kings are getting an impressive new stadium of their own. The arena’s front entrance will boast five glass aircraft hangar doors, each five stories tall, that turn the front of the stadium into an open-air entry, allowing passersby to peak inside. True California style with a touch of grandeur. Enjoy the wild roof shapes from the Stadium of Light. The funky angular -- some call it tetradecagonal -- roof covers a translucent façade, all designed by Populous for a showy display of light for the roughly 58,000-seat venue in Decines, France. 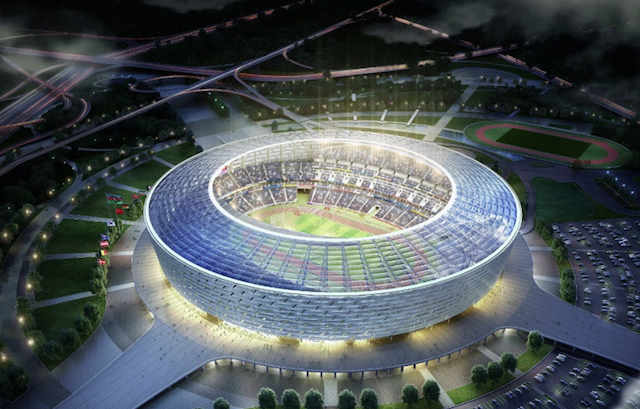 We can all watch as Azerbaijan steps into the mega-stadium world with a brand-new 68,000-seat venue designed for soccer and Olympic-style competitions. The translucent skin and retractable roof offer the chance for the venue to light up at night. 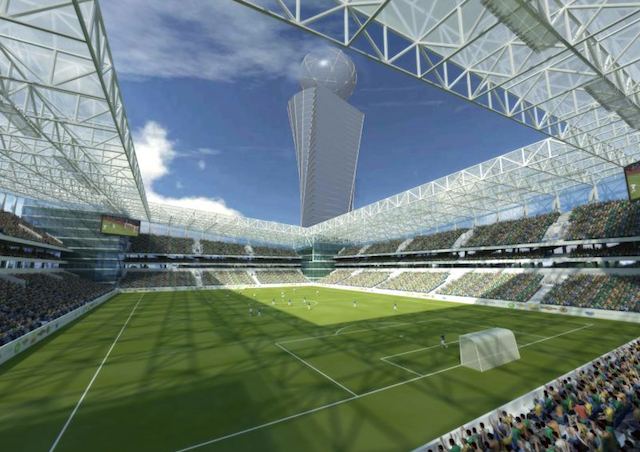 Turkey may have its crocodile, but Monterrey, Mexico, will have a stadium that acts like a fish. The new self-supporting tripodal structure will house over 50,000 in a tight-knit soccer format designed by Populous to let air flow into the venue via “gills” in the façade while keeping them all covered under the cantilevered roof. The asymmetric sweeping form of the metallic cladding is said to remind us of the famous Cerro de la Silla Mountain, a view framed by the roof. Talk about a fish out of water.